Management automation systems operate based on information from multiple sources. The information may contain gaps, duplicates, errors, and inconsistencies. That’s the reality. However, if low quality information is used to make management decisions, then the decisions and following goals will be ineffective and even inadequate. Inconsistent information leads to contradictory actions and may result in serious conflicts. Completeness - information contains all facts required by a management process. Accuracy - errors in information are within acceptable ranges. Actuality - latency in information is acceptable. Consistency - there is an absence of contradictory facts in information. Even if the quality of the initial information is unacceptable, automated systems can and should raise the quality to a satisfactory level. If they cannot, the the lack of information quality must be communicated to human operators that they might use extra care and compensate for errors. The responsibilities of the automation system in the processing and representation of initial information are defined by the principle of Shared Situational Awareness. Different decision makers have to address different problems, and information is presented to them in different ways: graphical, tabular, or textual. The representations may also vary in scale and time interval. But, in any case, the initial information, which is used to generate those representations, has to be shared. In a system there should be only one version of the truth. Also, it is well known that humans understand graphics much better than other type of information. Really, just by quickly looking at a graphical representation, a human is able to absorb the same amount of information that could be presented in several pages of writing. There is a special graphical language in the military called “military topography.” Using this a trooper, laying in the dirt and under enemy fire, is able to read the current situation and understand his orders in just a few seconds. With the latest computer technologies, military maps became interactive. A commander can now make his orders in just one or two clicks. The term “Common Operational Picture” (COP) was first introduced in battle management systems as one of these computer technologies. Quite often, when people say “shared situational awareness,” they refer to COP. However, there is a significant difference between them. Definitely, COP provides situational awareness. But besides that, COP also shows goals and objectives, progress toward those goals, and may even include interpretations that are important for decision makers. 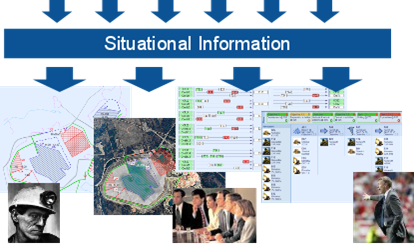 By using COP, situational information can be shared and understood quickly and efficiently. Initial information may come from multiple sources. It may contain errors, gaps, duplications, and inconsistencies. At the same time, the information used by a system has to be complete, accurate, actual, and consistent. Before using information, a management system has to verify, correct, and consolidate it. Different decision makers may use various forms of information representation - graphical, tabular, or textual. Regardless of the form of representation, the initial information has to be the same for all with only one version of the truth. Information validation has to be done at different stages of the management process and at different management levels in order to find and correct information errors. By making sure the shared situational information is the same for all areas of management, the decisions and goals made will be effective and satisfactory for the organization.